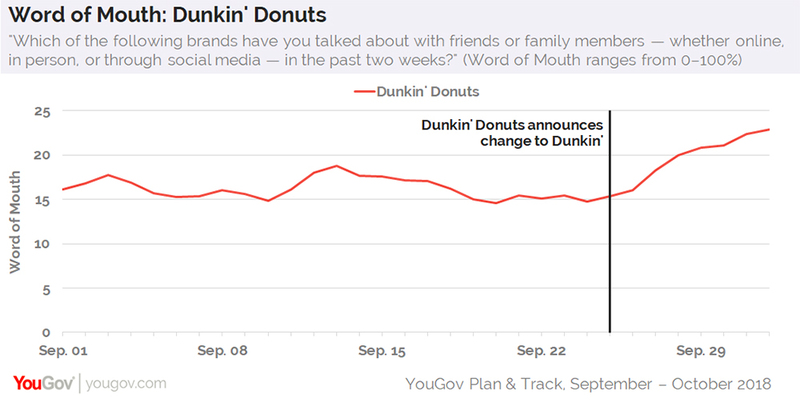 Dunkin’ Donuts’ recent decision to rebrand as simply Dunkin’ seems to have generated a healthy amount of positive press coverage for the restaurant chain, according to new data from YouGov Plan & Track. Since the official announcement, made on September 25, Dunkin’s Buzz score has climbed from 12 to 21 among the general public, indicating that an increasing number of US consumers are hearing something good about the brand. Additional figures suggest that more people are currently talking about Dunkin’ Donuts than at any point in 2018. Yesterday, for instance, nearly one in four (23%) consumers aged 18+ recalled discussing the restaurant chain with friends or family members in the past two weeks, up from 15% on September 25. Between January 1 and September 24 of this year, the brand averaged a Word of Mouth score of 17%. Following the announcement, Dunkin’ Donuts’ Purchase Consideration score — which gauges how open consumers are to buying an item from the restaurant when next in the mood for food or drink — briefly climbed from 28% to 30% before settling back to 28%. The company, which currently has over 9,000 restaurants across the country, notes that the official change from Dunkin' Donuts to Dunkin' will occur in January 2019.